This tutorial will take you through the "steps" of Entomology pattern that are a bit tricky so you can do it on your own. Keep in mind that not every step of the stitch is done here, only the ones that I thought could use illustration. 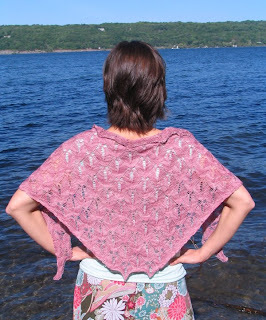 You can view the whole pattern here. Please let me know if there is anything you need explained further. I'm happy to help! Using dental floss threader, thread end of yarn through large loop at bottom of threader leaving a tail. 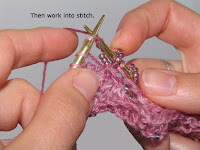 Pick up beads with threader and slide down onto the yarn. 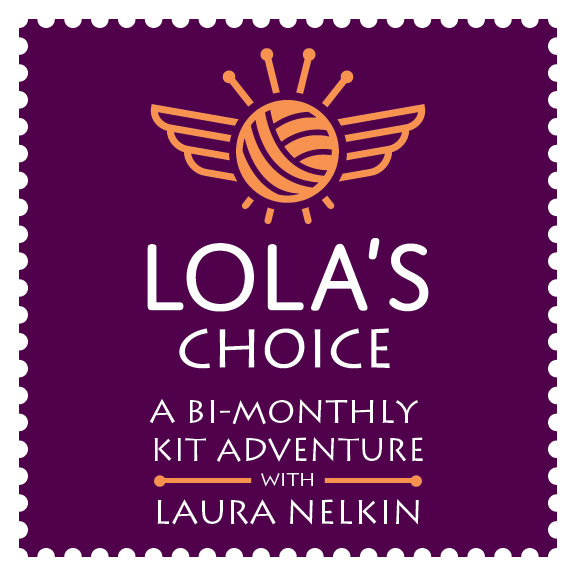 This is a great job to give a 9-year-old if you have one around! 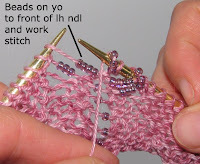 Slide bead up the yarn with your right hand until it touches the right hand needle, work next stitch locking bead in place. 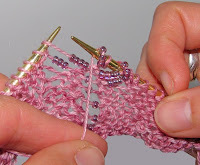 Slide beads up the yarn with your right hand until they touch the right hand needle, bring yarn with beads on it up and over right hand needle. 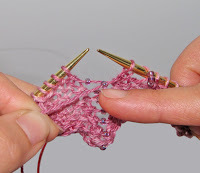 I use my right index finger to keep the beads in place until I work the next stitch. 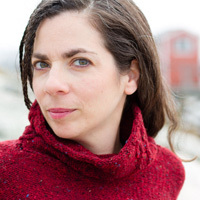 You want your beads to "float" on the yarn over's on each side of the bug motif. 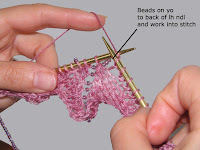 This is easy to do and you will get the hang of it once you start to work with the beads. 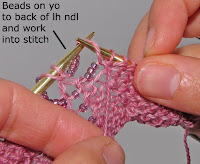 Important Note: This is referring to the beads on the yarn overs you made on the previous row, NOT the beads you are placing on the yarn overs, to do that, see the directions above. 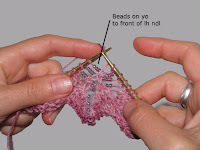 Pic 1: Knit into first yarn over with beads to the back of the left hand needle,then work center st(s). 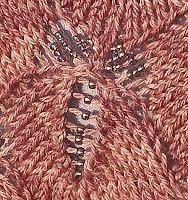 Pics 2 and 3: Knit into second yarn over with beads to the front of the left hand needle, then continue across. Pic 1: Purl into first yarn over with beads to the back of the left hand needle then work center st(s). 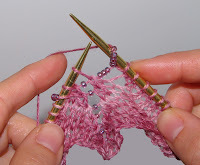 Pic 2: Purl into second yarn over with beads to the front of the left hand needle, then continue across. 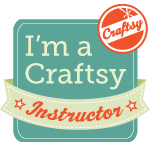 Why I haven't been knitting!